© Bloomberg. 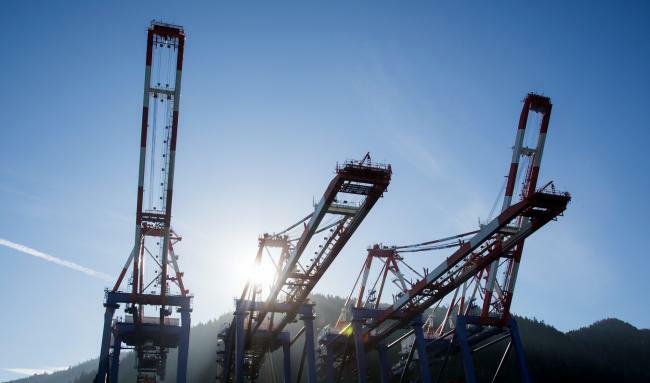 Container cranes stand at the Fairview Container terminal of the Port of Prince Rupert in Prince Rupert, British Columbia. (Bloomberg) — After a particularly tense week for Canada-U.S. relations, Justin Trudeau’s top diplomat said North American Free Trade Agreement negotiations will continue. While no specific date has been set for another meeting, Freeland said the leaders of all three Nafta nations believe talks can continue in coming months despite Mexican elections on July 1. Coming to a consensus on revisions to the two-decade-old trade deal has proved challenging, with Trump demanding any new agreement include a sunset clause. The U.S. president has also expressed a willingness to replace the pact with separate bilateral agreements with Canada and Mexico. Freeland was also on Capitol Hill Wednesday to discuss Nafta and U.S. metals tariffs with members of the Senate Foreign Relations Committee. Her trip followed a fiery week for the two allies. Trump pulled out of the final Group of Seven summit communique in a tweet from Air Force One on Saturday, and White House trade adviser Peter Navarro said Sunday there was a “special place in hell” for Trudeau after the Canadian leader pushed back against U.S. metals tariffs in his closing press conference. Navarro later apologized for his comment.